If you haven’t heard of blockchain I am fairly sure you will have heard of BitCoin. BitCoin along with other cryptocurrencies are in and out of the news headlines at the moment. The thing they all have in common is that they rely on blockchain technology and appear to be making some people a tad rich. Well as I always say ‘all things are complicated until you understand them’ and I’m not sure this explanation really helps, so here’s my attempt. Finance people like to keep ledgers. Now imagine if they didn’t. Imagine if the ledgers of all transactions were managed by people who did not know each other, but they all had a copy. Each copy is only valid if everyone agrees the transaction is valid and matches the ledgers held by everyone else. This would guarantee that no funny business was going on like fraud or double counting. The added benefit is that it is not controlled by corporate banks and remains anonymous and completely decentralised. That idea became Blockchain. A copy of the database is held on computers of anyone volunteering to help maintain the blockchain. You can simply download some software and it sits on your computer updating itself and you become part of the validation process. Sound good to you? 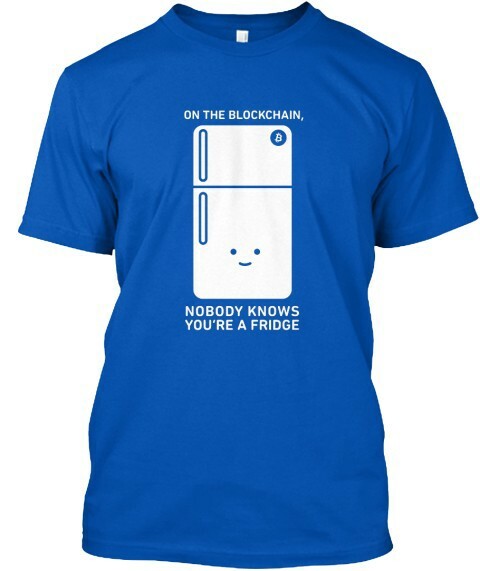 Well, before you excitedly order your T-shirt emblazoned with “On the Blockchain nobody knows you’re a fridge” (and yes, it’s a real T-shirt you can order that parodies the anonymity you can enjoy when using BitCoins to purchase things…) let’s just consider for a moment whether blockchain could be used to improve the way we manage health data. The concept of blockchain is appealing in health circles because it remains anonymous but allows data to be shared in a decentralised way rather than from a single record held in a single GP surgery or single Hospital. The notion of using blockchain technology for Patient Records and for other record keeping purposes has been around for a while. However, we’ve only recently seen real-world examples and proof-of-concepts. So what would be the key benefits for a health records system managed by a blockchain? Well, essentially the same as those enjoyed by Bitcoin. Decentralised, making sure that the integrity of stored patient data remains intact, providing complete transparency. Encrypted and tamper resistant, because altered block chains are rendered invalid. Made up of verifiable and immutable (unchanging) transactions. It would be a radical change to the way we currently manage health records and one that would need the blessing of both Patient and Privacy groups but nonetheless the opportunities to simplify the management of health data in a secure, accessible and validated way will likely mean that the change could happen sooner rather than later.